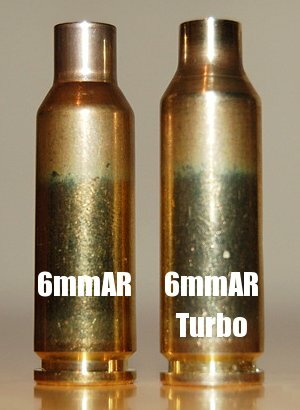 6mmAR Turbo: Ultimate AR15 Cartridge? Robert Whitley has developed the very accurate “6mmAR” cartridge based on Lapua 6.5 Grendel brass necked down to 6mm. This round is optimized for the AR15 platform, and provides excellent performance with 105-108gr bullets, with ballistics that beat both the .223 Rem and the 6.5 Grendel. Not content with the success of the plain 6mmAR, Robert has created a new wildcat, the “6mmAR Turbo”. By moving the shoulder forward (while retaining its 30° angle), Robert has designed a case that delivers more velocity: 2850-2900 fps with 105-grainers. 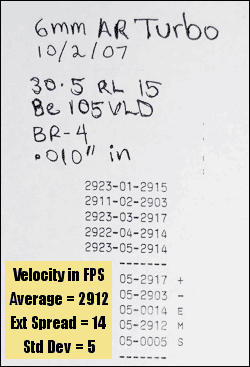 In driving the 105s to 2900 fps, the Turbo rivals the performance of the larger 6mmBR cartridge, in a round better suited for the AR platform, with less bolt thrust and better feeding from the magazine. Share the post "6mmAR Turbo: Ultimate AR15 Cartridge?"